Into Argath, Bastion of Illdaera #EQ #EverQuest – Nomadic Gamers, eh! It was time. 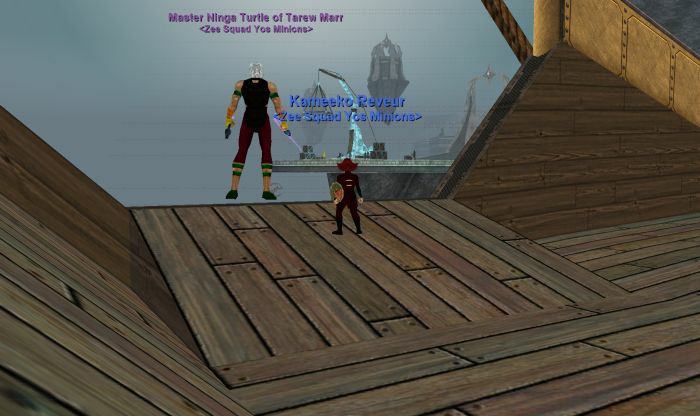 Ninga and I headed to steamfont where we waited for the blimp to arrive to take us to Argath. There’s a platform up on a hill not far from the Ak’Anon entrance and when the blimp is about to enter the zone you’ll see a zone wide message indicating it’s on the way. If you don’t want to travel there the ‘old fashioned’ way you can use a guild portal (if you happen to belong to a guild in any case) or you can see if you can hitch a ride from a druid or wizard who have unlocked their travel spells. For me the entire blimp ride was nostalgia of boat rides. We giggled as the blimp slowly came our way. It started off looking so small in the distance but when it finally docked and revealed its true size we were in awe. Levitation doesn’t work in Argath, so if you zone with it on and expect to just drop off the side and calmly float to your destination, don’t do it. The view reminded me a LOT of the Moors of Ykesha in EQ2. You are confronted by alien type NPC on a long dock and meander your way further in to find the NPCs you’re looking for. Alt W (the ‘find’ command) lists all of the NPC you may be searching for in case you’re like me and unable to find your way. Because the expansion is only two days old, the zone was absolutely packed. There were more than 150 people all trying to do the same small chain of progression which involves a language quest of the Argathians. First time visitors to Alaris will want to speak with Atleris, the Council Pinnacle, inside the Council chambers. Argath is the gateway into Alaris and is the site of a slatemated conflict between the Argathians and the invading forces of Erillion, the City of Bronze. It can be divided into four sections. The top area (the “crown”) and passage downward (the “neck”) are both entirely safe. The neck leads down to the “arms” which is a fortified area overlooking the erupted forge (the “belly”). The outer areas of the arms and the entirety of the belly are full of hostile creatures. Looters and thieves are found among the Argathians in the arms. And in the belly are the Erillion forces who will attack on sight, as well as the steel masses and floating blades who are enemies to both the Argathians and the Erillion forces. We picked up the first quest required for language progression, one from Captain Walkath, that required us to fight a few of the Erillion invaders. The problem was that so many other players had the same frame of mind. We found ourselves a little niche and went to work on the small group of mobs before deciding that we would probably have an easier time of things if we waited a little while for the initial rush of players to pass through. The encounters were not especially difficult at this level, our group consisted of monk (Ninga), healer merc, enchanter (myself), and tank merc. Mobs can be partially slowed, but they haven’t been able to be fully slowed for a few expansions now. We killed one of the 14 mobs we needed and then decided that our time would be better spent continuing our progression of the Underfoot expansion (two expansions old now) so we headed to Pellucid Grotto. I loved what I saw of Argath, it’s just a little too crowded for myself. We’ll be back before too long, I’m certain. I really enjoy your EQ posts. It really gives a nice look into the game for those of us who never got to experience Norrath in its original state. I’ve always thought that maybe I’d be better off in EQ or UO. Some game that’s managed to keep a core audience for over a decade, atleast. Games today just lack the depth and charm I find in older singleplayer RPGs. If I were to step foot into EQ1 now, where would you suggest I start?